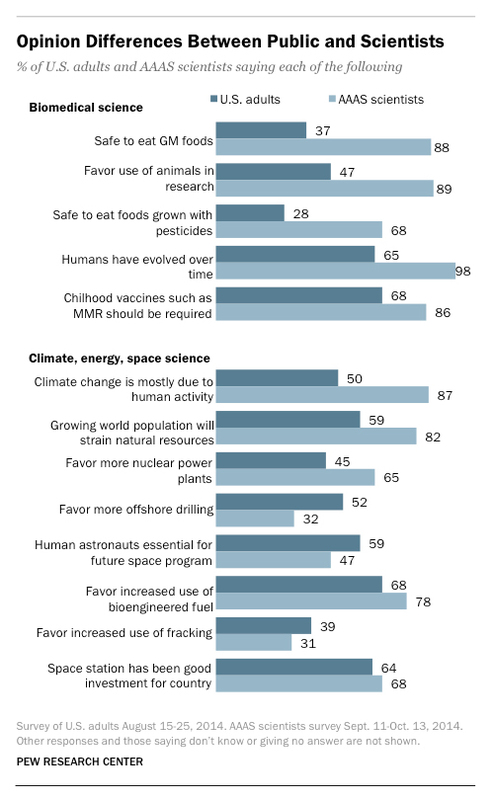 The headline from stats web site, http://fivethirtyeight.com/, says Americans And Scientists Agree More On Vaccines Than On Other Hot Button Issues while the headline from Mother Jones, reporting on the same data, says, This Chart Shows That Americans Are Way Out of Step With Scientists on Pretty Much Everything. You wouldn’t know from the headlines that they were reporting from the same data. If you ignore the text and just look at the data in each chart, while the chart from http://fivethirtyeight.com/ breaks the data out by political-party affiliation, the numbers do appear to be the same (or the same enough). The rhetoric and visualizations, however, are quite different. Or, another way to look at it is that it always pays to go to the source data.